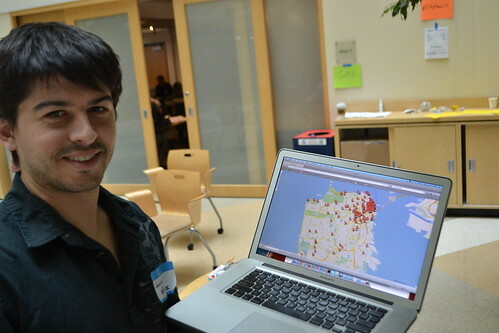 Granicus co-founder Javier Muniz shows his day of work on the SF Fire App at CityCampSF. In the case of CityCamp San Francisco, participants created outcomes during the event by curating data describing AED locations throughout the city. AEDs are automated external difibrillators, those devices you see in airports that can be used by just about anyone to stabilize cardiac arrest victims. AED locations are important data that can save lives, particularly if they are open and portable. Curating this data is non-trivial, however. Collecting AED locations is labor intensive. Mistakes in data can cost lives. Data provided by the City of San Francisco is a decade old in some cases. Some places you’d expect to find an AED don’t have one. So the challenge arises: how do we fix this? Thanks to smart folks who came to CityCampSF, that question is being answered. Two days later, CityCampSF will make San Francisco the first city to host a second CityCamp unconference. The list of registered participants is amazing. Several city employees are signed up, as are some of the mayoral candidates. CityCamp Raleigh Is On June 3-5, 2011! CityCamp Raleigh is three days of open sourced talks, workshops, and hands-on problem solving, to re-imagine the way the web, applications, technology, and participation will shape the future of Raleigh. CityCamp brings together government, business, neighborhood, non-profit, and academic communities to work toward next generation solutions for Raleigh. You don’t need to be technical either–we need ideas from a variety of participants to help create solutions. The purpose is to highlight the power of participation, promote open source in local government, and explore how technology is used to increase government transparency. CityCamp Raleigh will foster communities of practice and create outcomes for participants both during, and after the event. We’ll be hearing inside views of the city from local leaders and getting inspiration from experts on social innovation and open data, before a participatory barcamp to discuss problems and new ideas, and finally ,a work day to see what solutions we can create. We want to collaborate and create the next generation of government using community-based solutions. CityCamp Raleigh is how open government, “Gov 2.0,” goes local–and you can join the movement. I’m glad to report that we’ve rolled out means to direct financial and in-kind support to local organizers. Thanks (again) to e-democracy.org, CityCamp now has a registered 501.3 (c), not-for-profit, fiscal agent. The recently published Sponsor Prospectus provides overview and details for how individuals, companies, and non-profits can make tax-deductible contributions through direct payments and sponsorship packages. The purpose of this action is to create a modest fund that will be used to boot-strap CityCamp activities world wide. Most funds will be distributed to CityCamps in the form of grants to local organizers who agree to host a CityCamp and meet the expected criteria. Some funds will be used for coordination and collaboration activies for all CityCamps, including the CityCamp web site(s), the forum, administration, and special events. Our approach is to provide just enough structure and support to grow and sustain CityCamp and not a bit more. We want to make it easier for CityCamps to happen by helping to raise the funds and other resources necessary. Local organizers aren’t required to use this sponsorship program. CityCamp is still an “open source brand.” Anyone is free to use the Sponsor Prospectus for their own CityCamp fundraising. The only requirements for using the CityCamp Sponsor Prospectus are to 1) agree to the “Start-A-Camp” criteria and 2) reference the source prospectus URL. I hope that you, dear reader, will do what you can to support CityCamp. For more information email Kevin Curry. Want to contribute right now? We’ve been hosting meetups all over. Some cities are recapping what’s happened locally since their camps. Other cities are being introduced to CityCamp for the first time. Don’t see a meetup where you live? Host one! CityCampBTN is about rethinking the way the web, technology and participation will shape the future of our city. It doesn’t matter whether you’re someone with a great idea or a problem to solve, or if you’re a developer with specific skills – if you’re passionate about our city and want to be inspired to create new solutions, then this is for you. We’ve lined up three days of inspiring speakers, discussions powered by you and hands-on building of solutions. And it’s free. Part of the CityCamp movement, started in Chicago last year, CityCamp BTN brings together local government, business, community sector and academic communities, to work together. It’s essential to get a good mix of perspective. We had civil servants, vendors, journalists, non-profits, and citizens. It would not have been as successful if it was gov-to-gov, vendor-to-vendor, or even gov-to-vendor. It’s essential that the conversation not revolve entirely around tech and data. In 2010 we can assume that technology and data are involved. We’re just scratching the surface on process. And the processes involved are not just about methods and means for collecting-publishing-visualizing data. Providing greater opportunities to get citizens’ voices heard and to increase their engagement in civic duty is important. There is a new and important role for journalism: tell the stories behind the tech and the data. However, journalists may not have the education and knowledge to do this well. Interpreting stats is hard. I am excited to see Global Integrity stepping up to start a “help desk” specifically to work this problem. I think there is a new “extreme programming” model that papers could adopt; or perhaps to put it in terms papers already understand: pair your journalists up with data-viz-stats people like you pair them up with photographers. People want what City Camp provided. We are going to learn from it, refine it, and keep it going. Don’t wait for me or Jen to keep City Camp going. Anyone can do this anywhere at anytime. Copy what works. Adapt for your local perspective. Just do it. one of our amazing sponsors, the Aldridge Foundation, has agreed to put up a ten thousand pound prize fund to implement the best innovation we create at CityCamp. We’re very pleased and proud that the Foundation has given us, and the city’s innovators, that level of commitment. Most of all we’re hugely excited to be able to turn some of the ambitions and ideas of CityCamp into real, delivered change. The full details of the prize will be announced on the day, but it will take the form of a development fund to help the team behind the best idea work with the relevant public services over six months to deliver their vision. There’s no point in waiting until the event. Start now! CityCamp Arizona is next week, Tuesday, February 15th in the City of Chandler.